It's Wednesday my friends - let's do this! First up this week is a great little end table restyled by Kate. 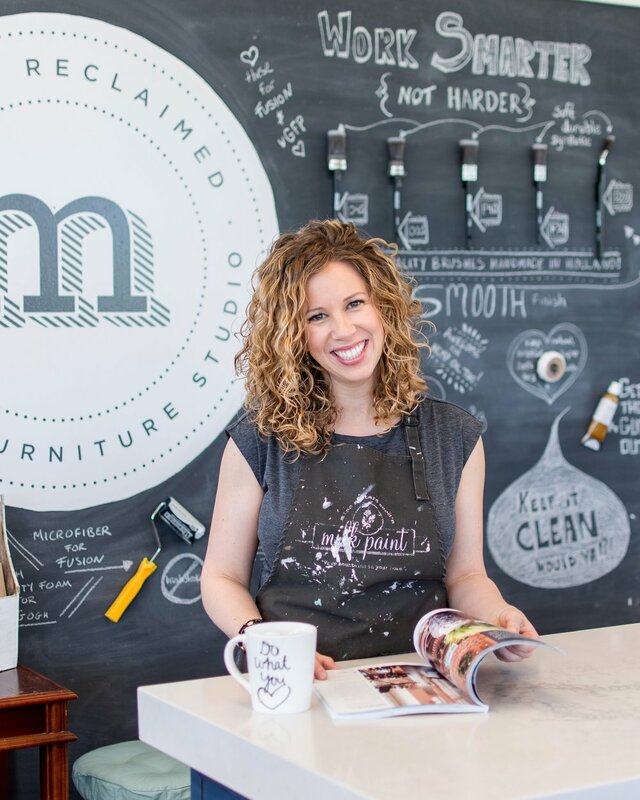 Using Miss Mustard Seed's Milk paint in Typewriter black Kate, brought this table from shabby to classy! She finished the table with a bit of distressing and some hemp oil and it looks great! Thanks for sharing Kate! This one is from a while ago but definitely deserves to be shared! Check out this old stereo cabinet restyled by Elisa. Such a nice neutral colour! If the stereo is still in there - how fun is that? And if the stereo has been removed - amazing storage! It' a win/win! Thank you so much for sharing Elisa! Next up this week is Christine's restyled buffet - turned TV console. How fantastic is this? Painted in van Gogh's Patina (a most popular colour at our studio), this buffet looks so pretty! How clever of Christine to remove the top drawer and use the space for her TV components - great work! Thanks for sharing Christine! Last up but definitely not least this week is Chantal's adorable restyled school desk. Chantal used Miss Mustard Seeds' Tricycle red and two new handsome little knobs from us. I love it! Such a bold beautiful colour - thank you for sharing Chantal! 'Mad Men' restyled side table. This table is currently available at Mango Reclaimed for $95. 'Toronto' original artwork also available at Mango Reclaimed for $175. This great little mid century modern side table is all class. 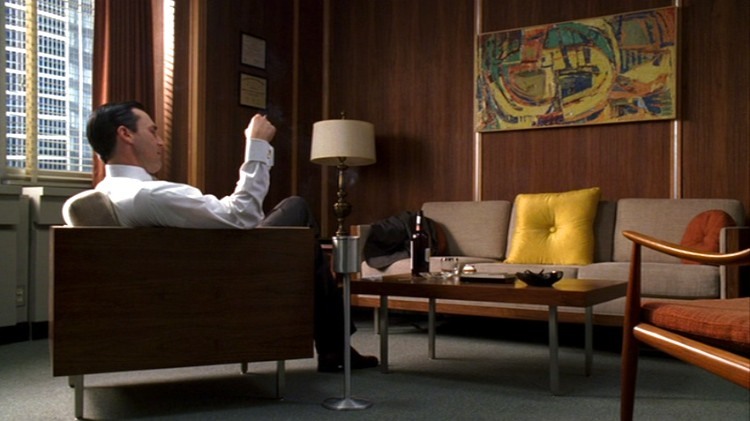 Check out these images below from the set of Mad Men - wouldn't this little table fit perfectly in Don Draper's office? This awesome 2 drawer side table was sanded right down as the previous finish was literally flaking off. 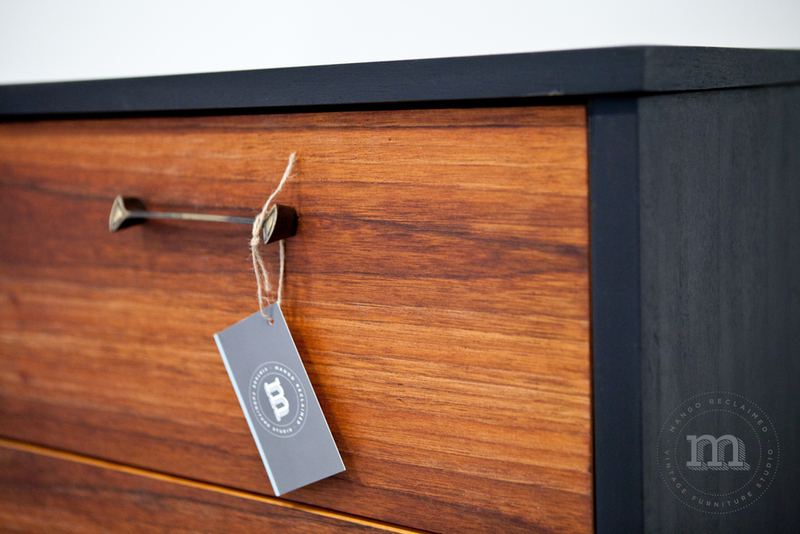 The drawer fronts weren't painted, they were simply oiled using hemp oil from the Miss Mustard Seed Milk Paint line. Just look at how beautiful the wood grain is after being oiled! This hemp oil works wonders on any tired old dry wood - and because it is all natural and completely food safe you can even use it on your cutting boards. Seriously love this stuff! The rest of this table was painted using Miss Mustard Seed Milk Paint in the truest black 'typewriter'. 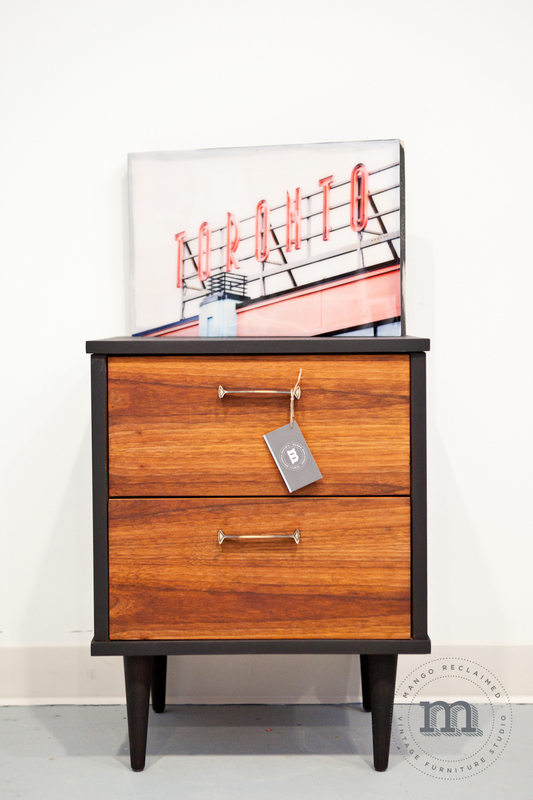 With a protective layer of hemp oil over the paint it has a gorgeous matte black finish. Below is a peak at the before and after. . . do you have something that needs a Mango Reclaimed restyle? If yes, contact us or sign up for a fun and inspiring workshop.